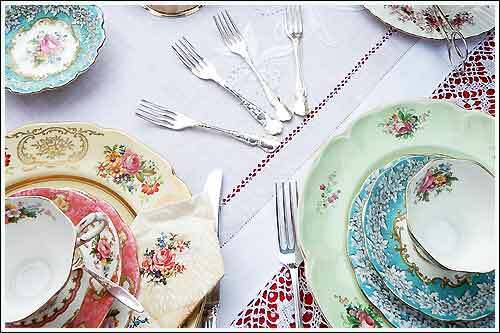 Maggie is Hawkes Bay's Specialist in hiring of exquisite English Vintage China and many other vintage items. She is very passionate about her extra-large collection of vintage china - 450 plus vintage cup sets, vintage cake plates, platters, lace and embroidered and caterers linen, crystal glassware, various glass vases, silverware, vintage picnic baskets and other props. All items are available for hire to Caterers, Event Planners, Production Companies and private clients for those Weddings, Baby Showers, Birthdays, Hens Parties, Bridal Showers, or any celebration. Maggie loves sharing her passion with those who care for the antique, vintage styling. You have the choice: - Maggie allows a ‘DIY’ hire option, or she can take care of your vintage styling and set up for you. Maggie talks with utmost pride and self-satisfaction of her possession and is always keen to give advice. Call Maggie 06 8445 693 to organise your items for hirage for your bridal shower or that special wedding set as a vintage theme, and make your event memorable for all the right reasons. 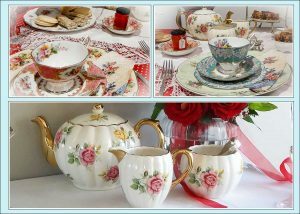 I hope you enjoy taking a tour through my web pages and seeing what High Tea Hire has to offer in the few samples displayed as Antique, Vintage, and Art Deco goodies.